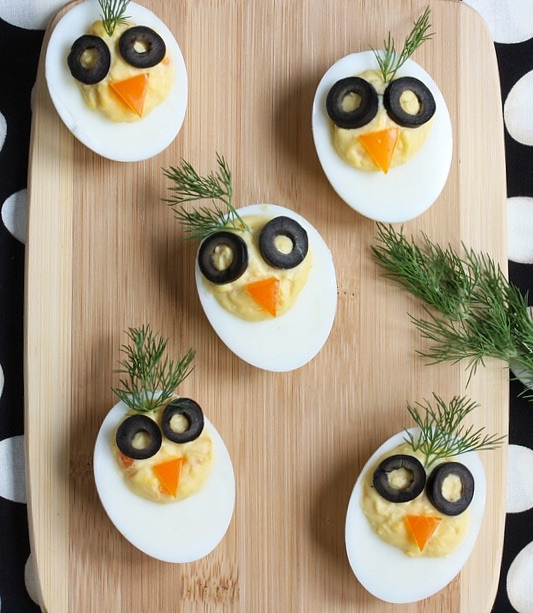 If your kids get excited about going on Easter Egg hunts, they’ll definitely be eager to try these adorable baby chick deviled eggs. Cut the eggs in half, lengthwise. Carefully remove the yolks and place in a bowl. Mash the egg yolks with the back of a fork. 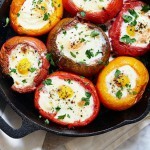 Add the mayonnaise, bell pepper (or carrot), mustard, salt, and pepper, and stir to combine. Place the egg yolk mixture in a zip-top plastic sandwich bag. Seal the bag and snip half an inch off one bottom corner. Squeeze an equal amount of the mixture into each egg white half. To decorate the chicks, cut small triangles out of several strips of bell pepper (or cooked carrot) and use them for the beaks; use the sliced black olives for the eyes, and the dill or parsley, as desired, for feathers. If you don’t have olives, use cooked green peas or halved black beans for the eyes.